The slab of rock felt warm against my back. A soothing breeze mingled with the late afternoon sunshine and I closed my eyes, reeling in the sheer pleasure of it. My gear lay strewn all about me on the bedrock, drying out from an earlier rain. Before me a row of massive spires obliterated the horizon. Later, as evening descended and light seeped away to the west, the spires faded into dark silhouettes and seemed to grow ever higher into the sky. The sharpness and sway of their shapes played on my mind. Like a campfire flashing up into the cool evening air, their smooth, curving shapes surged toward the sunset: gargantuan black flames against a warmly glowing atmosphere. I imagined them in motion; flickering, raging as the flames of a roaring black fire, licking the sky in flashes over geologic time, deceptively frozen only in the present moment. As night fell one giant surge of blackness curved purposefully, reaching with two outstretched fingers in a rising wave toward the crescent moon. In an arcing descent, the moon seemed to respond, its silvery light moving steadily closer, its intoxicating luminescence growing ever stronger against the fading sky. 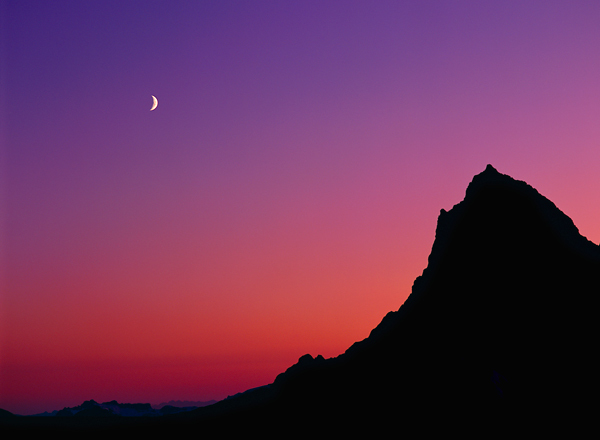 In the night, the sky would yield entirely to the moon, and the wishful mountain, bathe in its light.